Today Victoria is here to share with us one of her to-die-for breads, read on to find out how she made it! After that, don’t forget to visit her blog and follow her on Pinterest! Hi! I am Victoria and I bake and blog at Victoria ~ Bakes. I am a pure bred Singaporean but am now living in Beijing with my DH (Dear Hubby). I’m currently a stay-at-home-wife who retired 2 years ago to focus on my family and baking. I started baking 5 years ago, and I will always remember the first loaf of bread that I baked with my bread machine. It looks like… a meteorite. Yes, you read me right, a meteorite! One can never imagine how wrong can a loaf of bread be, baked with a bread machine some more… My DH told me to do some self-reflection and soulbread-searching and from then on, I try to beautify my bakes as much as I can. Just like the Japanese saying, 七転び八起き nanakorobi yaoki (literally translated as “fall seven times and stand up eight”), which means “When life knocks you down, stand back up”, even though my first loaf is a flop, I finally succeeded in my bread-making with the 5 Thousand Dollar Bread! 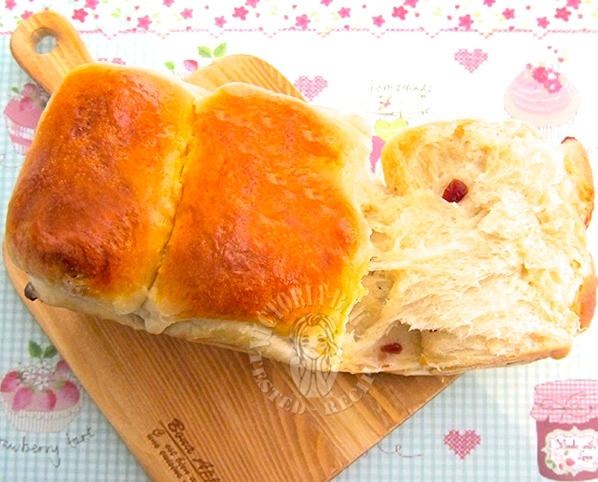 So today, I thank Jasline once again for inviting me to be her guest baker… and since she reminds me of a pretty and petite baker, I’m presenting her and all of you today with this soft and fluffy toast ~ white, pillowy and specks of cutie red! Prepare starter dough the night before: Add butter into hot water and stir till butter has melted over low fire. Bring to a boil and turn off fire. Mix in flour and sugar to form a soft dough. Cover with cling wrap and chill for 18-24 hours. 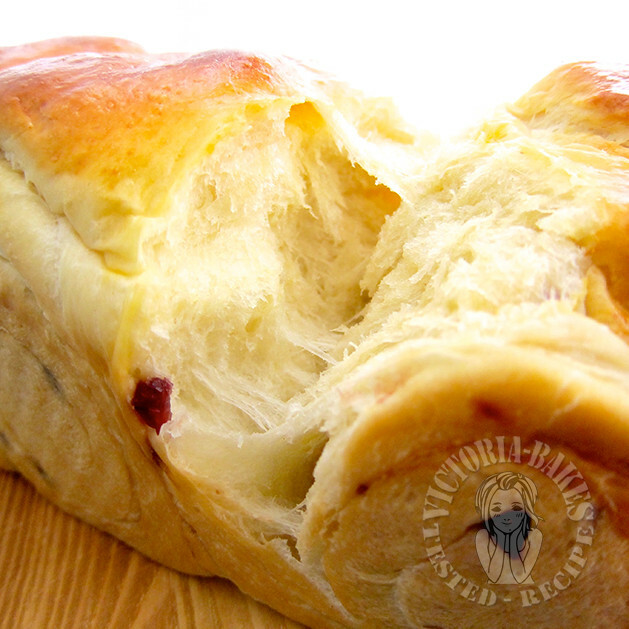 Mix all ingredients (except shortening and dried cranberries) and knead till you get a soft dough. Incorporate shortening and continue to knead till you get a window pane membrane. 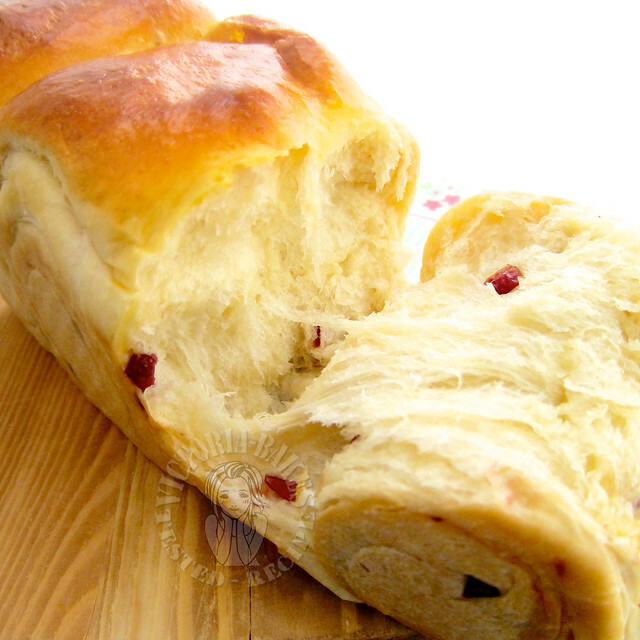 Knead in cranberries. Allow to proof till double in size. Punch the dough down and divide into 3 equal portions. Rest for 30 minutes. Roll each portion of dough out, and do a three-fold. Rest for 10 minutes. Brush the top of the loaf with egg wash and bake in preheated oven of 180 degrees Celsius for 30 minutes. Hi! If I wanted to add pistachios to this, how much should I add? 🙂 Thank you! Hi Jessica, sorry as this is a guest post, I don’t have any answer. Try adding 50 grams to the bread dough first, and add more if you want. Let me know how it goes for you! When do I start mixing the starter dough to the main dough? Hi Amelia, the starter dough needs to be chilled for 18 to 24 hours before using, so make it the day before! Hi Summer, usually about 1 to 2 hours is needed for a bread to rise to double its size. There can be a lot of reasons why your bread dough did not rise, is your yeast too old? Or did you use cold milk when making the main dough? If your yeast is too old, it will be less active and will rise slower or may not rise at all. If you use cold ingredients, the bread will still rise, but it will take a much longer period to rise to double its size. Hi can i use BM to do d kneading n proofing as one loaf ? Hi Diana, sorry can’t help as I don’t have a BM, if you did try it out, please let us know! hi Jasline, what loaf pan did you use, I’m totally new to baking! And do you know where I can find sanneng loaf pan? didn’t find sanneng 450g loaf pan at phoon huat. The dough turns out to be very very soft and sticky. It’s so difficult to handle. Am I doing it right? Is this how it is supposed to be? Hi B! I’ve gotten the reply from Victoria, here goes! Yup. Mine turns like like muffin batter even after 30 minutes of kneading. I’ll take note on the amount of water used next time. Will definitely try this recipe out again. Thanks!! Hi there, this recipe looking good, do you think I can add sesame powder in it?? hi, i’ve made the starter dough on saturday but only have time to make the bread today, do u think i could still use it? 🙁 thanks! Hi ~ did you chill your starter dough? if so, the question is has it turned grey and smell? if so, pls discard. usually, the general rule of thumb is we should use the starter dough by third day, but my practice is to dump it after end of day 2. Agree with you Raymund, I hope to try this recipe soon! Doesn’t it? It’s so lovely that I crave for it whenever I look at the photos! Wow! This is a lovely bread! Thanks for sharing Vic and Jasline. Yes it’s super lovely! I hope to try this soon!